Ranting to anyone who will listen. Nothing is more humbling than receiving credit for someone else's great work - not that it stops me. Ralph Osterhout is a close friend of twenty years and four years ago he invited me to start working with him and the amazing team at Osterhout Design Group. To say Ralph is legendary for his work and presence is a disservice to reality. A short list of his inventions includes PVS 7 night vision goggles, Navy Seal Rebreathers, the Shark Dart (look it up), Dry Suits for swimming under the polar ice caps to blow up bad guys' submarines, the Yack Back player from Home Alone, high intensity water pistols, the weapons "Q" presents as his own in The Spy Who Loved me and the magic trick where Teller drowns on stage in Penn and Teller's act and these are just a few. So when he asked me to stand in for him at Augmented World Expo and present the teams work I accepted only with tremendous humility and apprehension. Here it is. 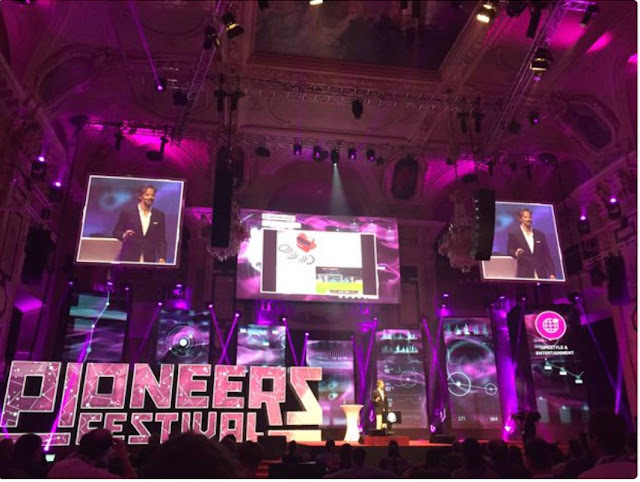 The team at Pioneers are doing a stunningly amazing job of building an innovation community in Europe. In the summer of 2016 they gave me the opportunity to stand in one of the most awe inspiring venues in Europe to talk about VR and AR. The most amazing part is at the end where I can barely control the excitement of the live demo working. Ken Rutkowski started a casual group for a bunch of friends to get together on Saturday for breakfast and collaboration. It was never only about business help and support were offered and provided in all aspects of the life and work. The group grew in connection and size and now Ken hosts MeTAL in a theater in Los Angeles. He asked me many times to come to talk about games and the game industry, but this time he asked me to talk on a day he was not around. I went somewhere else completely. Before mainstream discussions of fake news, filter bubbles and the Russians, I got myself worked about what was going on with social media and search. This is probably the only talk you will ever see that quotes Ghandi, Tolstoy, Karl Popper, Margaret Mead and Stuart Smally all in the same discussion. In my never-ending quest to prove to my parents - and myself - that my career in games is more than personal indulgence I spend a lot of time thinking about how many things are driven by the technological advances and understanding of human behavior derived from the work of so many creative geniuses. In this talk from Ken Rutkowski's MeTAL in Los Angeles I flap my arms and articulate why everything from the Ford Factory to Uber to a job at IBM is really game and how the game industry learnings can save the world - or at least make it more efficient.